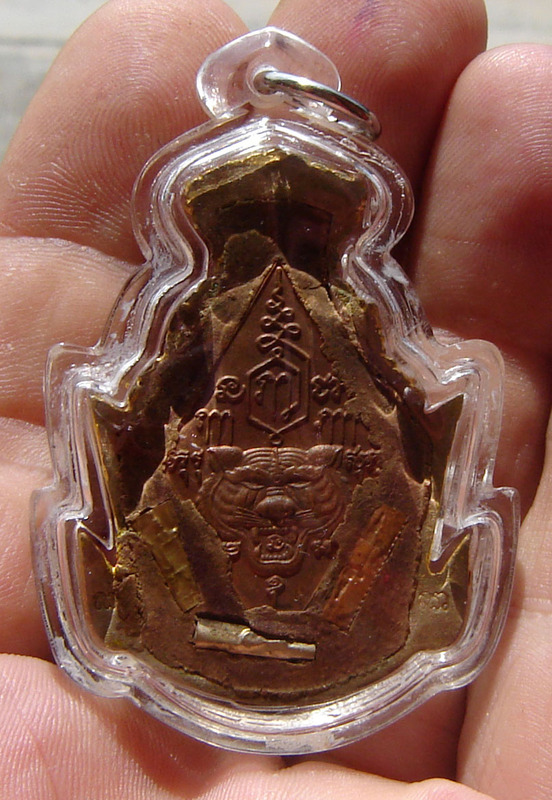 Siarn Phu Ruesi Ta Fai Kroo Deity mask made from Nuea Samrit (Bronze) with sacred powders, 3 Takrut and Tiger Yant – Luang Phu Naen Kampiro. This is the top of the range bronze metallic version of this edition of amulet which was made in five different materials. This Nam Rerk release (first pressing with richest concentration of sacred ingredients), is covered with gold leaf, and hand painted on magical bronze metal alloy, with Ploi Daeng stone in the third eye. Free waterproof casing included. Phu Ruesi Ta Fai is the Boroma Kroo (Root Guru) of many different walks of life, but is mostly revered by those who are learning the Vedas, Magical Incantation and Empowerments, Meditation, or Kata chants. He is a protector and Guide to those who revere and pray to him. He is a breinger of Wealth and Prosperity. He stuffed the rear with sacred powders made from earth taken from 7 cemeteries, 7 salt licks, 7 ponds and lakes and 7 ports. In additon the powder had ‘Chan Mak’ from LP Naen (chewed betel nut) Maha Wan pollens, powdered Ya Jindamanee, Benjarit powder, and has one ‘Ploi Daeng’ precious stone insert in the third eye on the forehead Takrut Rasi Plaeng Sarn are inserted into the powders. 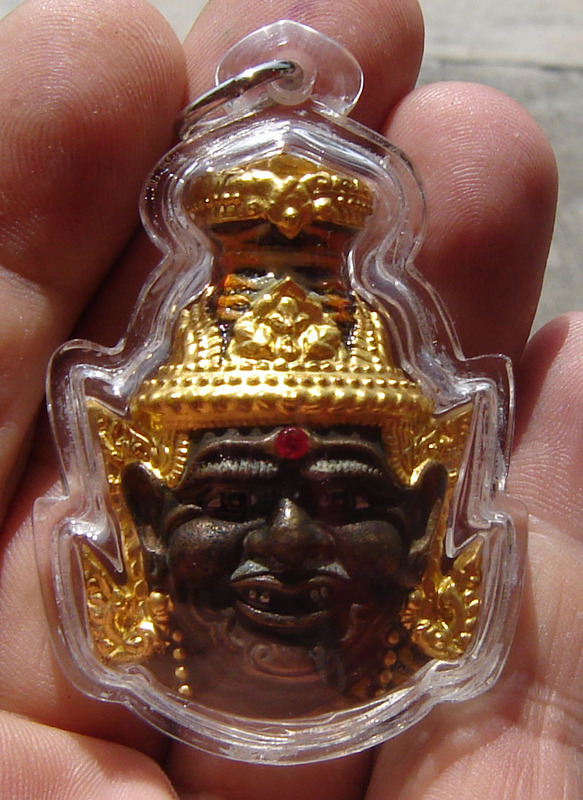 The amulets were empowered further by Luang Phu Naens incantation of Itipiso forwards and backwards recital, Itipiso Paed Tidt (8 directions mantra) both forwards and backwards, and the Kata Baramee Samsip Tidt (30 directions mantra). Maha Sanaeh (Attraction and Charm), Metta (Likeability, induce friendliness), Kaa Khaay (good Selling power), Hnun Duang (improve Horoscope), Plik Chadtaa, Glab Raay Glaay Bpen Dee (change bad outcome back into good outcome), Khab Lai Phuut Phii Bpisaat (fend off ghosts and demons), and increases Merit in Meditation practice. Removes obstacles in Life.